MILPITAS, CALIFORNIA - Milpitas Christian School is pleased to announce that the week-long campaign to help victims of the “Camp Fire” in Paradise has raised a record $3,300. Initiated by student leaders at Milpitas Christian School, this creative fundraiser for grades 6-8 will provide funds to meet critical needs for displaced individuals and families. Can a Penny Make a Difference? How can middle school students make a difference? Student Council members at Milpitas Christian School voted to raise money for fire victims through a “Penny War” competition. 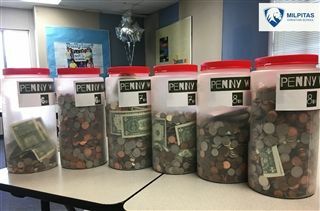 The ninety middle school students were encouraged to donate pennies and dollar bills into their class’ collection jar; each penny was worth one point. During the three-minute passing time between classes, students could also deposit silver-colored coins (nickels, dimes, and quarters) into a competing class’ jar. Each nickel subtracted five points, each dime subtracted ten points and each quarter subtracted 25 points. The 6th and 8th graders formed an alliance to defeat the 7th graders. The winning 6th graders earned the privilege of an in-class potluck and movie. Milpitas Christian School challenges every student to grow spiritually, socially, emotionally, and intellectually. Later this month, grades 7 and 8 will be helping at the Milpitas Food Pantry and The Family Giving Tree, respectively. All 7th and 8th grade students are expected to serve a minimum of 6 hours per trimester and share what they learned through a “reflection” form. Founded in 1974, Milpitas Christian School (MCS) seeks to transform lives for Christ through excellence in education, relationships and service. MCS offers education to preschool, elementary and middle school students. Starting in 2019, 9th grade students will be admitted to Milpitas Christian College Preparatory, a high school with a STEM/STREAM (science, technology, robotics, engineering, arts and mathematics) focus. MCS accepts students of all races and nationalities and does not discriminate in any of its programs based on gender, race, or national origin. For more information or to arrange a campus tour, visit MilpitasChristian.org or call (408) 945-6530. Middle school students raised funds through "Penny War"